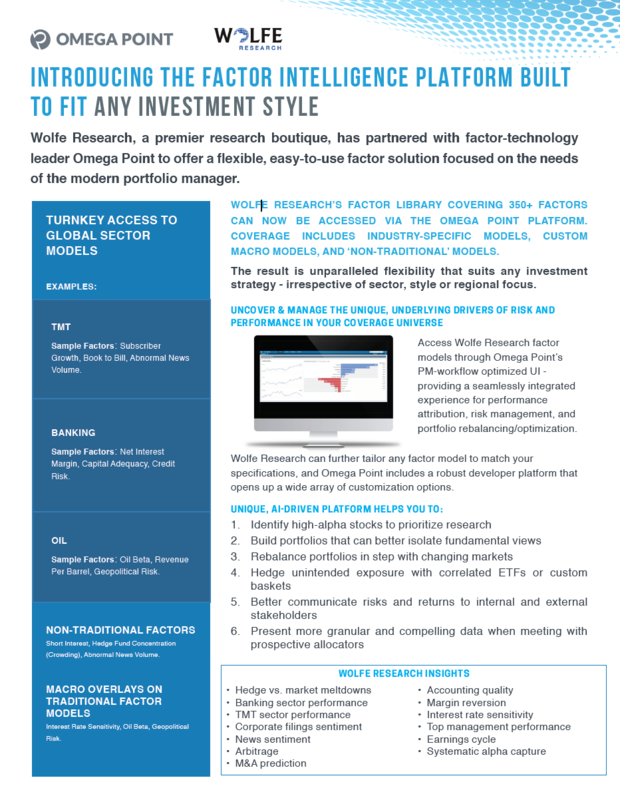 Omega Point has partnered with premier research boutique Wolfe Research to integrate Wolfe Research’s proprietary factor library of 350+ factors onto the Omega Point Platform. The result is a flexible, web-based portfolio intelligence solution built to fit any investment style - irrespective of sector, style or regional focus. When mapped to your portfolio, the result is an unequaled ability to uncover and manage the unique, underlying drivers of risk and performance in your investing universe. With the addition of the Wolfe Research library, Omega Point’s coverage of traditional factor and ESG models is now expanded to include an extensive range of industry-specific models, custom macro models, and ‘non-traditional’ models. If you’d like to learn more about this new combined platform, please contact Omega Point today. Wolfe Research, LLC, is a premier research boutique with an affiliated broker dealer. The firm is committed to the creation of best-in-class product and ongoing strategic growth. Wolfe Research provides bottom up and top down macro and stock specific sector research to its institutional clients. The firm is based in New York, NY with additional offices in Boston, Dallas, San Francisco, Daytona Beach and Stamford.